In this article I’m going to completely cover layout and positioning with Cascading Style Sheets and xHTML. 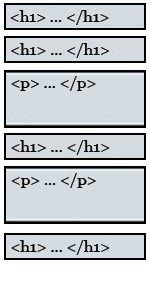 If you haven’t read/viewed my xHTML W3C Tutorial or my Adding CSS Style to HTML article, you should do that first. It is very important to enclose all of your code into a series of block elements. Everything on your page should be enclosed by a Header or Paragraph Tag. If you do that, not only will you be xHTML compliant you’ll also have no problem with positioning your content. Now, I’ll give you some sample code to play with, so you really get div’s! Here I am demonstrating how to style a div element. This is pretty exciting stuff. Let’s make this div more stylish, by editing some CSS code. If you don’t know how check out my CSS Tutorials. You can edit the div element’s margins and padding to move it around on the screen, just like we did in the box element tutorial. The best way to learn is to start messing around with HTML and CSS in a simple text editor. Now every <h3> tag, just inside the brain2 div, will be the color purple. You can also change the text within the div by creating some CSS that targets the <p> tag also. We’ll your almost a CSS Guru. I just have to teach you how to move your content around the screen. Then you’ll be able to create multi-column layouts or irritating popups. Whee! To get the brain div you just created to place itself in the right corner of the browser, requires just one line of text: float: right; Here is an example of a web page using float: right. Pretty simple huh? The only thing you must remember is that the div you are floating, must appear before the div you want to be to the right of. As you may notice the brain2 <div>, is not floating to the right of the title. That is because the title block element appears in the html code, before the brain code. If you are happy with the distance between the div you are floating, just adjust the padding and margins until your happy. By the way, you just learned how to make a two column layout as well. A Header, that you can style to your hearts content, using all the CSS styling you have learned. A Footer, that you can style as well. A main content area that isn’t flowing into the right sidebar. You can create additional divs inside of this main div and style away, by the way. A Right Sidebar, which you can place additional divs or that can become a left side bar, by just changing float: right to float: left! All of the layouts I have been showing you, are known as liquid layouts. If you resize the browser window, the content area stretches to fill in the additional space provided. A Locked Layout on the other hand will stay in place, no matter how the browser is resized. Each type of layout has their own positives and negatives, so choose which ever fits your specific project. There you are. That’s about all there is to creating a Locked CSS Layout. Just to make sure you understand. The opening <div> for the master <div> would appear right after the <body> opening tag. The closing </div> for the master, would appear right before the closing </body> tag. Yes, you can tell the browser exactly where to place your div’s down to the pixel and it’s called Absolute Positioning. I have to warn you though, that it is very easy to break the structure of a web page if you don’t precisely calculate the exact placement of your div’s. Over the years, when I have been called in to fix someone else’s CSS errors it has almost always been because of errors with Absolute Positioning. 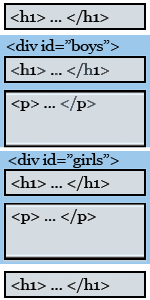 The major difference between normal and absolute positioning, is that the order of the HTML code doesn’t matter. Think of your divs as playing cards. You could stack them up on top of each other with absolute positioning. In fact, there is a new property for absolute positioned divs that specifies which div is above others on the page (The Z Index). Have you ever gone on a web page and seen a popup window, that was embedded in the web page itself and followed you around as you scrolled? Aren’t those irritating? Well to end this whole CSS Style HTML Tutorial, I’ll show you how to make one! With this great tutorial I will be able to create an aweseome design for my new wordpress site. Thx for this. Excellent tutorial..I am developing an interface in MS CRM but had not much idea about layout positioning…this text is great help…kudos. this css Once im done learning i will send a donation. The comments are testament to your expertise..I have also watched several videos and yours is by far the highest standard.. I am trying to insert the image in mozilla fire fox, and internet browser and but the img tag is not working at all. Sorry I couldn’t get to you quicker. I have a new HTML Video Tutorial and CSS Video Tutorial that you may prefer. This is actually working now, I found the solution. When write any id “” double cots, it is not working but if I write them without “” it is working…by the way the tutorial was very nice. I enjoyed very much. I’m glad you got it working. WordPress which my site runs on forces all quotes to be displayed as back quotes. Sorry about the confusion. My new tutorials eliminated that issue. Thanks for a wonderful site having great tutorials. God Bless you, sir. Thanks for one’s marvelous posting! I really enjoyed reading it, you happen to be a great author. I will make certain to bookmark your blog and definitely will come back very soon. I want to encourage you to definitely continue your great work, have a nice afternoon!